Please help us maintain this FREE historical site, please SUPPORT OUR ADVERTISERS, Thank You. The Official home of the most famous cowboy's in the west! follow @IkeClanton on Twitter! NOW PLAYING ~ "Doc Holliday" ~ Download Ike Clanton Bard of Tombstone album on iTunes today! Worlds First & Only "Live" Internet TV Western "Live" Every Tuesday night! Old west history, special guests, blind beer tasting, whiskey tasting, historical skits, video clips of past shows and a few good laughs! 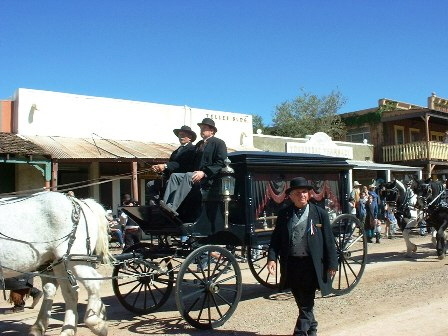 Ghosts of Tombstone - New Ghost Photos! join Ike Clanton "Live" in the haunted Allen Street Theatre for a paranomal experience you'll never forget! Ghost photo's and stories, high-tech ghost hunting equipment and a "live" paranomal investigation! Schedule and times will be updated on the Allen Street Theatre facebook page - Like it here! History of the most famous cowboys in the west.. .Tombstone "Live"
"The Bard Of Tombstone" CD Album Order Here! Special Offer: Buy more than one CD Today and you'll receive a 20% Discount! You can unsubscribe at anytime and your email address will NOT be shared with anyone. This site is dedicated to the Clanton family and the history of Tombstone Arizona. our site was also chosen as YAHOO site of the week. I would like to personally thank all of you for your continued support of our site, sponsors and advertisers. Send us e-mail by Pony Express! © 1996-2013 All Rights Reserved - No Part of this web site nor any of it's contents may be reproduced in any manner. TombstoneArizona.com. webmaster.